Happy Thanksgiving!! I'm so thankful for so many things that I wanted to do a Gratitude album. And this idea came from the Attitude of Gratitude which was started by Tessa Buys. The Sweet Peach Juicy kit was perfect for this. So I had a "free" day this week and work all day on it. Yes, you read right I completed this entire album in one day!! Here is the cover and it reads "Love the Life you have been Given"
Here are the first 2 pages: This is my hubby and kids! I'm so grateful for both and don't know what I would do with out them! Here is a close up and it reads "I'll always choose you"
Here is the next pages and it is the about the gratefulness for my faith in God and for my children's trust in me. This is a story about Hannah looking a me one day and how much it meant to me. These pages are about my parents and my little love for my chai tea. This is a close up of what I wrote about my parents. I love the cards that were included in the kit. And these 2 pages are about my friends and being a stay at home mom! I'm really graetful for both of these. I love those transparentcies that are in the kit! Here is a close up of the tag I that is in the envelope. Here is a close up the tag I made that is in the envelope. These 2 pages are about our home and how grateful I am we have one that is ours. And the next page is about how thankful I'm for our doctors. Close up of the writing and that picture is of Hannah when we took her to a specialist. And the last 2 pages are of our family time we spend together! Love these times and they mean so much!! Thank you for stopping by and have a great Thanksgiving!! I got to play with some paper last night so I pulled out The Paper Bakery add-on from August. I love the colors teal, white and black! And she added that beautiful splash of yellow! And there is a sketch up so I used it. This is my silly Hannah. I took here outside to get some pictures of her running around and everytime I took her picture her tongue was hanging out. I took the yellow fabric and cut a circle out and then sewed around the circle and pulled it closed. I used some Crate Paper alphas and Authentique words. 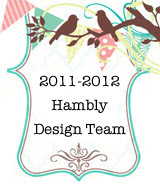 I waited up last night to see if I made the Hambly Studio design team but the later it got the more I figured I didn't. So since there is a time difference I just went to bed and said a prayer. Woke up this morning early to pack my hubbies lunch and had to check right away. And my heart skipped a beat when I saw and email from Allison (Hambly Studio). So I opened it and I made the team!!! I'm beyond excited and so thankful for this opportunity. Here are 2 of my layouts I submitted. 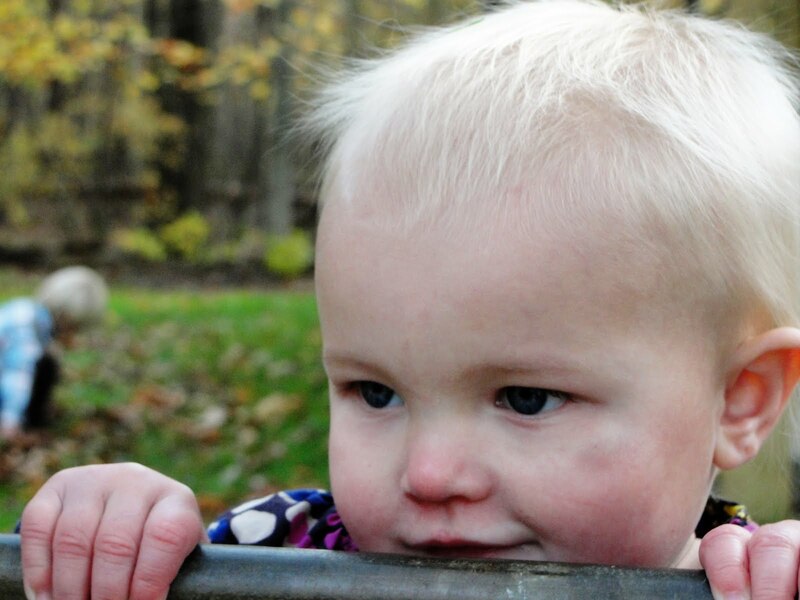 This one I love the picture of Hannah holding her daddy's hand. I took some Hambly Screens and cut them into leaves. I then stitched down the middle of each one. And here I took some Washi Tape and made a cute flower. This is of "My Noah". That is what I like to say to him. He is so stinkin' silly! Here I took some Hambly Screens and papers and cut out circles. I then stitched inside each one. I had this key in my stash and just had to add it. Hannah had this thing today about sticking her tongue out. She normally does not have this face but today it was "her" so just about every picture has this look. Isn't this too cute!? He found the one and only flower growing and picked it and gave it to her. See those bib overalls...there his Dad's!! Yes, the one and only hand me down we have! They are even in good shape for being 30+ years old! 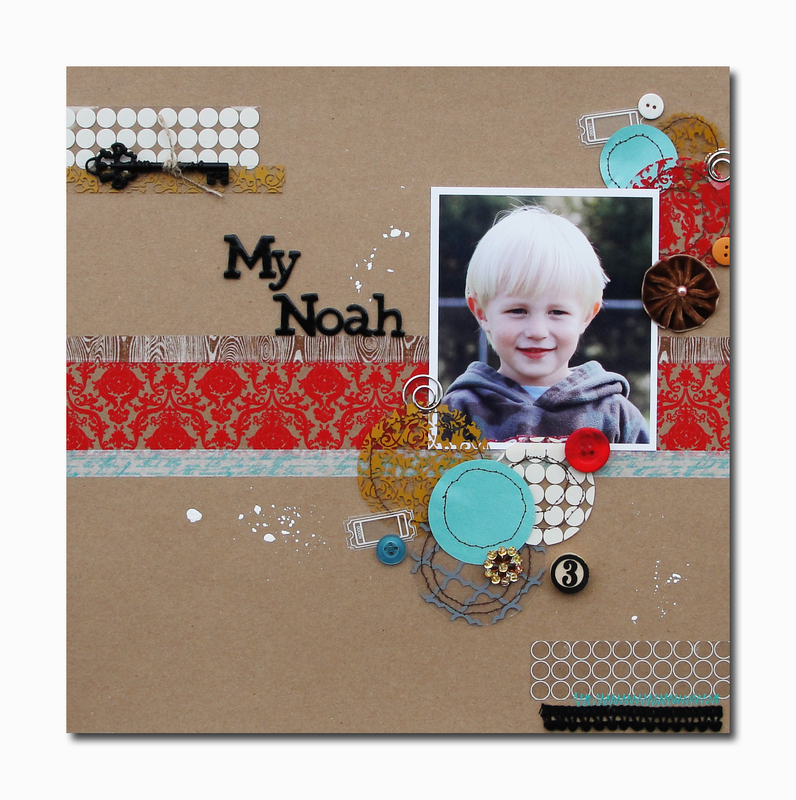 This is another layout I did using the gorgeous Sweet Peach November kit. I just love Kraft paper! I think kraft goes with just about everything. And I love how mist and paints look on it. This my oldest Faith. She put a leaf behind her ear. I used the paint that came in the kit to splash a couple of places and then used some to box in the square pieces. And I love the Authentique piece of paper with the bingo cards all over. That is were I got the smile card. Here is a close up of the paint with the square pieces. And I add the Studio Calico Buttons. The little words are from the Crate paper alpha sheet. Love the little doilies from Kasier Craft. See the paint splash? 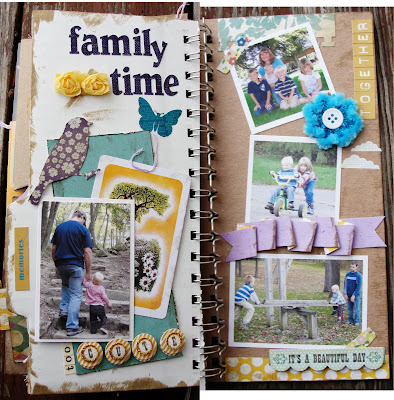 Thanks for looking and if you are looking for a fun challenge head over to the Sweet Peach Blog I just posted one. Here is a sneak peak at what I have working on with the November kit from Burlap & Buttercups. The colors in this kit are so pretty and can be used with so many different pictures. There are paper from Authentique, MME, 7gypises, Pink Paislee, & Crate Paper. There are only 4 left so grab yours before there gone. Also I just posted a challenge over there so head on over and check it out. I hope you can play along! This is a picture taken of Brian and I at a wedding. We don't get many pictures of just the two of us. I love the Basic Grey sticker sheet that comes in the kit. It has such fun, pretty sayings. These are the banners stickers that came on the sheet too. I stitched through them. I want to also want to share a little tip with you. I like to use the packaging to mount my stickers on and then cut around them. It makes it easier to move them around till you get them were you want them. And it makes it easier to put the pop up dots under them. I have been wanting to do the Attitude of Gratitude all week so I wrote down what I wanted to do and plan to put this all in a mini album. 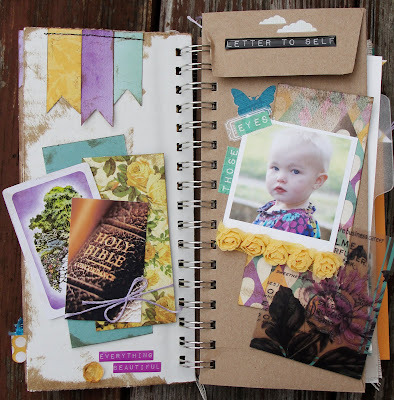 Thanks to Tessa over at Perfectly Precious for giving us some starting points. Here are my first 3 days. So to begin this month of gratitude I want to say I'm so thankful for my family. I so thankful how in the past month we have be come so much closer and we are really trying to work better together as a family. And I feel a lot of that starts with our attitudes towards each other. And so that is why I feel this is important to me to stop and had a new attitude of gratitude. So like this picture let's keep things level and not unequal. Yesterday I was driving home the other day from MOPS and just happen to look back at Hannah and Noah in their carseats and I caught Hannah just looking a me with these trusting eyes. It made me realize how much they trust me. Just sitting their as I drive them safely home trusting my every decision for them. It made me so thankful that I have my Father God that I can trust to hold me when I need it. 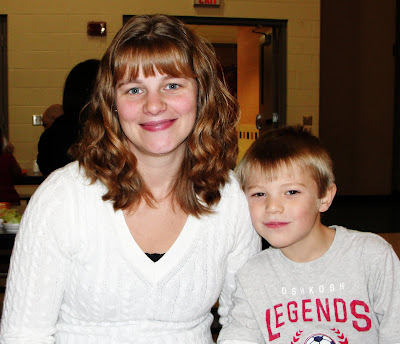 Today was Faith and Ty's Thanksgiving lunch at school. I'm so thankful the school has continued to do this. I remember when I was their age and my mom and aunt going every year with me. It was a special time for us and I hope they will remember this time when they get older. 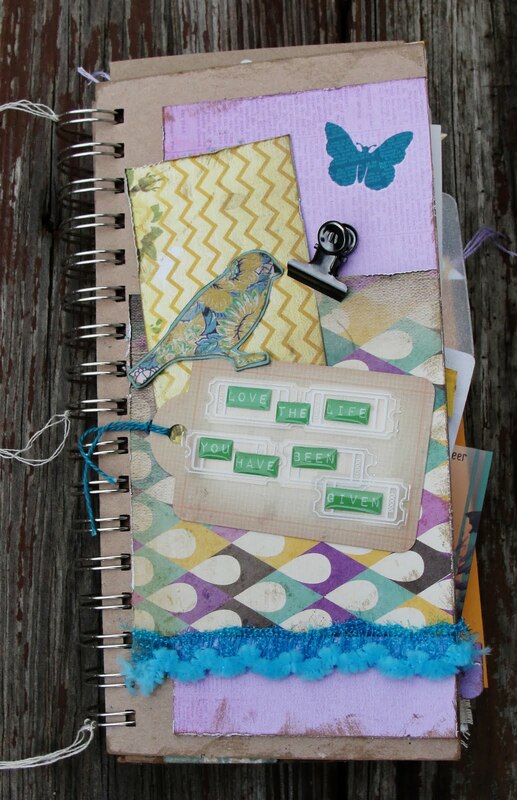 Yesterday I had some scrappy time so I pulled out the beautiful November kit from Sweet Peach! I love every little bit in this kit! 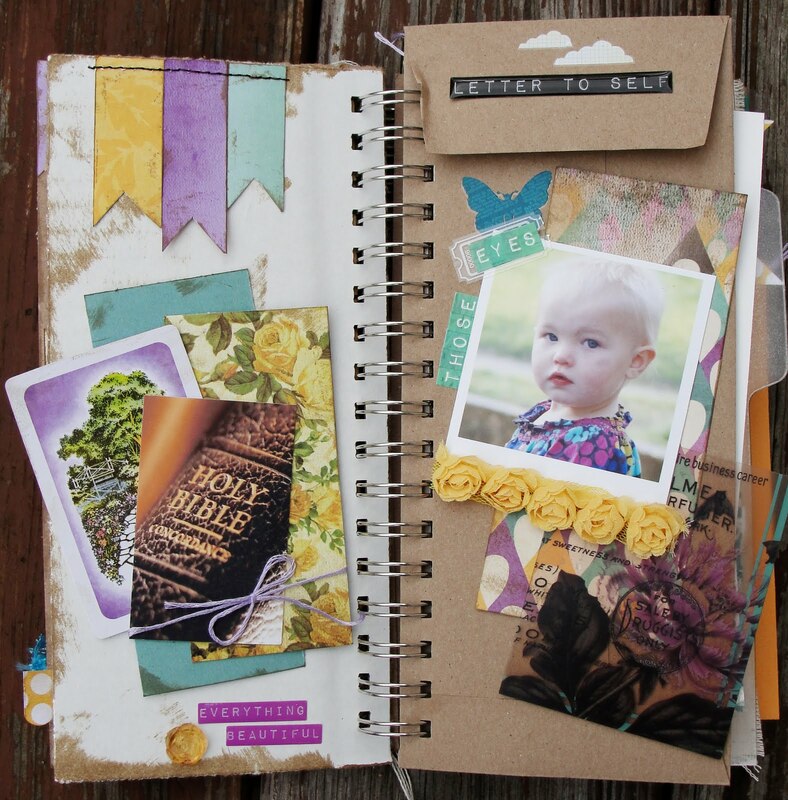 The beautiful colors of paper, cool little embellishments, and that cute little yellow rose ribbon! The list could go on! The papers are Crate Paper Random, Studio Calico, Authentique and some MME. So if you haven't checked it out go HERE and see the beautiful kit! This is my 4 blessings! I love them so much! I took them next door to get some fun fall pictures. I used a sketch from Pencil Lines. I love the "quilt" look so I machine stitched around each piece. Love the MME bling! I layered the canvas button, flower, and chipboard button. I used the Studio Calico rubons. This layout is of Hannah riding her hand me down bike. It's just her size. Love this picture of Hannah riding away. Love the little crocheted flowers and canvas buttons. This tag and alphas are from the Crate Paper Random line. And I added the Kasier Craft Flowers and SC buttons.